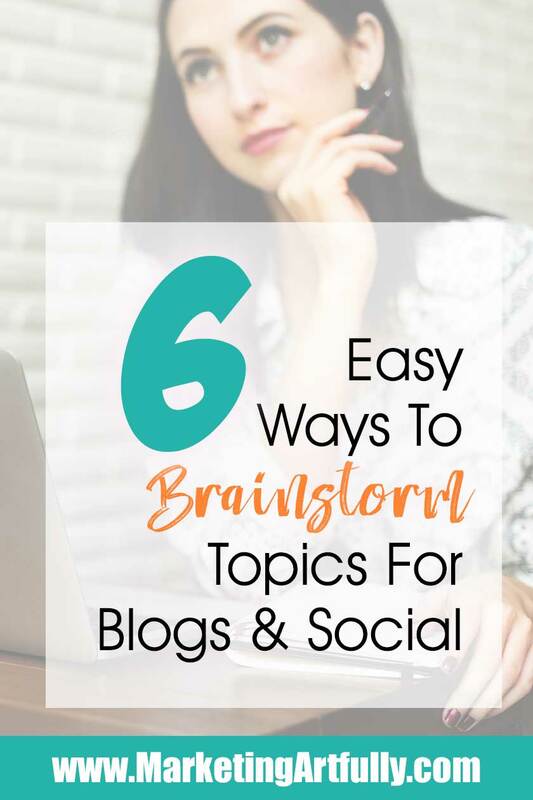 Finding topics to write about for your blog, social media or newsletters can be a challenge sometimes. Here are 6 tools and tips to help you feel creative PLUS a free printable to help keep your ideas organized. As you go through here and pick out a few places you use over and over again, it will help to make a folder that you can run right through in your browser. I have links for all my favorite research places, top to bottom and just go down the list until I have enough ideas to stop and get to work! 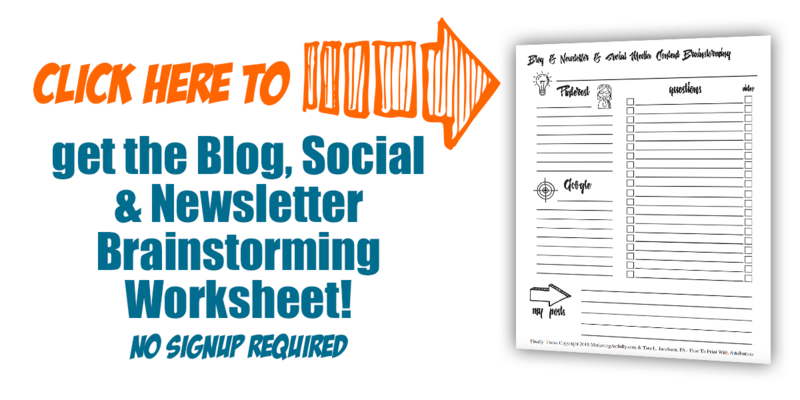 Also I use my Brainstorming Worksheet to write down everything I want to remember … free at the bottom of this post! Just one more thing to think about! We sometimes start our search with a preconceived notion of what we want to write or talk about. THAT is how we wind up writing a post that makes us happy but isn’t going to get us lots of views, engagement or likes. Instead start with what the different sites have said OTHER PEOPLE are interested in and fit your message to those topics! So if you are a Realtor start with “real estate”, an accountant start with “saving”, or a seller start with “jewelry” instead of what you “think” people are interested in! I write all of these down and then go back and forth to see what other ideas I can come up with. For example, I like – tips, tools, strategies and quotes… the rest are not that interesting to me! Additional Resource :: I use the free browser plugin called Keywords Everywhere to see what the search volume is for those terms. 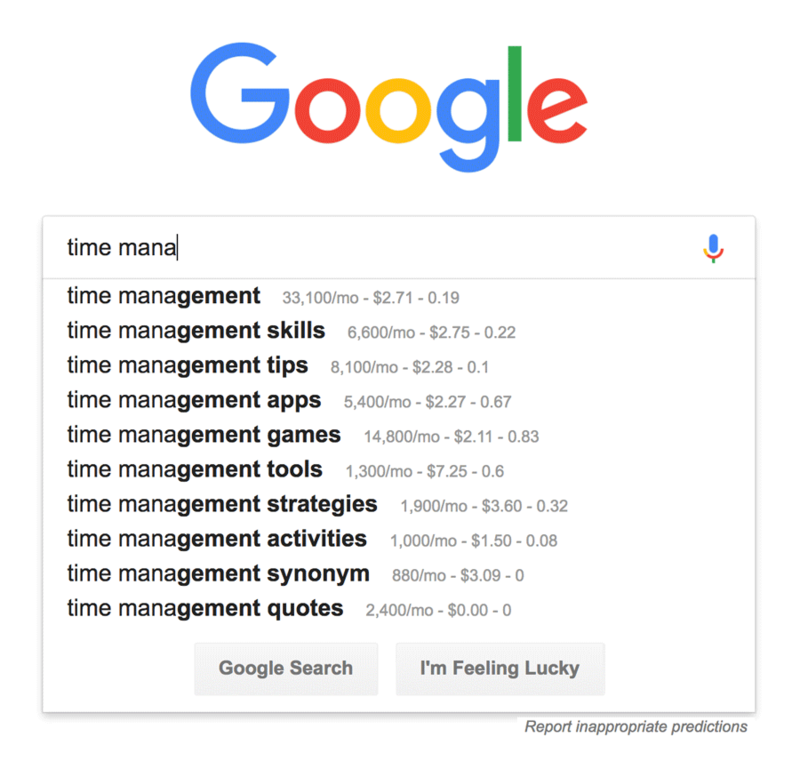 Once you pick a search you will find that there is a section called “people also ask” that can give you direct questions that you can answer as a whole topic or as parts of what you creating. Last but not least is the bottom section that shows you all different kinds of other related searches that people do when looking for your topic. 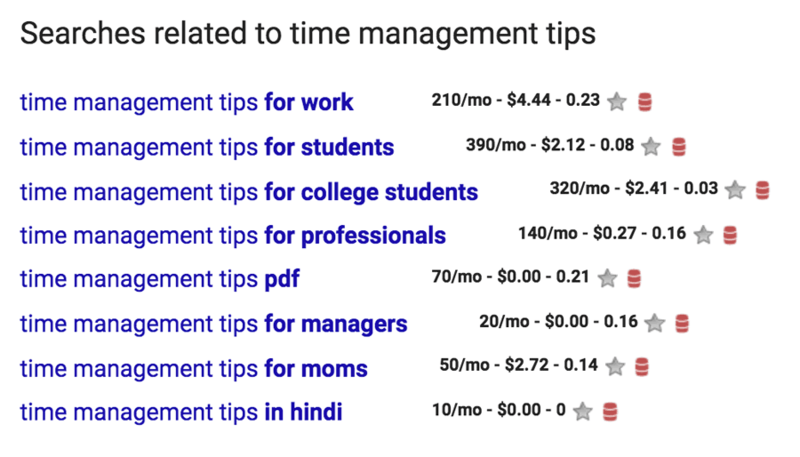 Interesting… it looks like I could make a time management PDF for professionals that would be of interest to people. Don’t get freaked out if there are not a lot of searches for your topic. We are just at the brainstorming phase right now! Because my audience is heavily weighted towards women, my next best source is Pinterest. Then simply do a search in Pinterest and then look at the extra boxes that show up under your results. Those can spark all kinds of ideas for me to write blog posts or to include in my newsletters to real estate agents! Once we have some keywords that work for us, we can start drilling down into questions that people are actually asking right now on Answer The Public! Let’s go with accountants this time as that is a super “boring” profession that is hard to find content to write about… not really! Just so you aren’t confused when you get there, this is the little guy that you ask for help! Any of those could be a good start on a blog post or social media share! This one really points out that while we would like to talk about our specific product or service, what people want is information that is interesting to them! 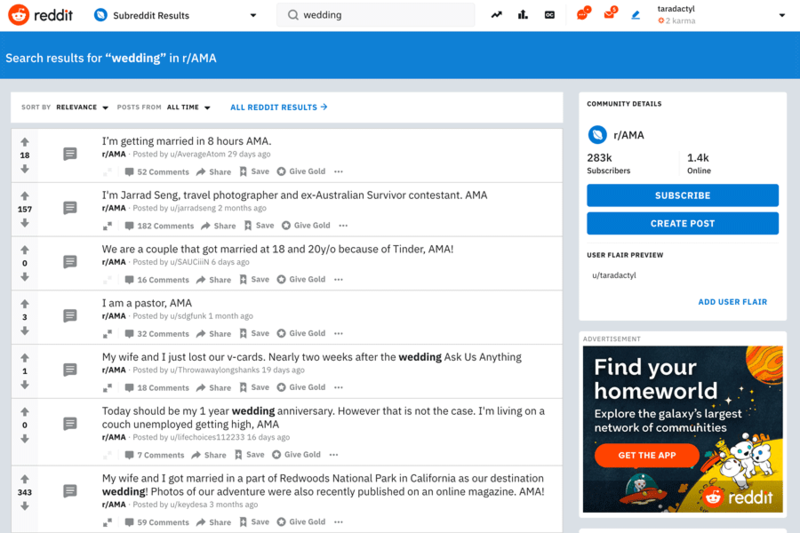 So if you sold wedding rings, you could write or post about the latest styles AND THEN include your listing as an example. Do you have a special connection to the redwoods, or was it a kind of “this is pretty let’s go here” moment ? This is probably a weird question, but did you do your dress shopping together, or did you keep the tradition of not seeing it till the day of? Did you go camping for the honeymoon? I’m very interested in how you planned a wedding in a national park. I currently know of one couple who is trying to do the same thing in Utah. Do you have any insight on actually finding accommodations in the park and did you have any special permits? Knowing how REAL people phrase questions can make a huge difference in how you present your content! I use the app Texture app to see so…many…magazines! 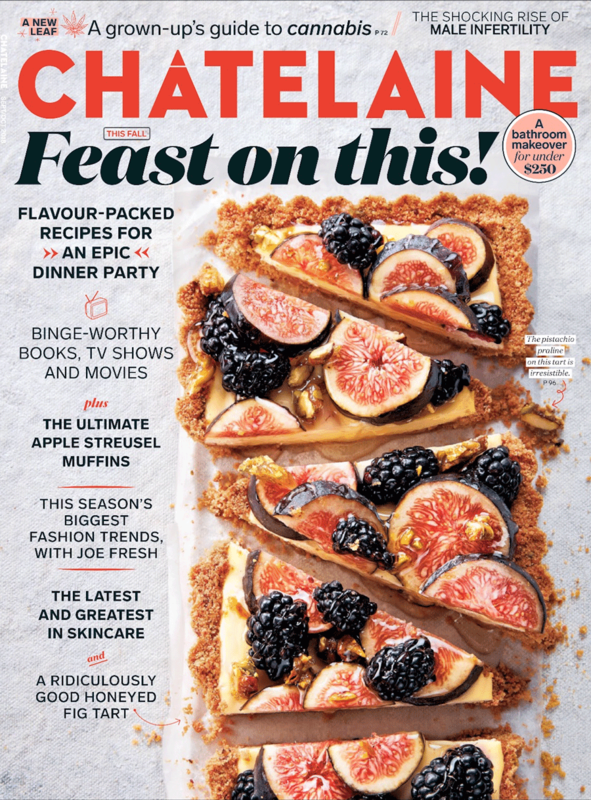 You do one little subscription and get access to a bunch of the most popular magazines. I used the idea of “Binge-worthy Books, TV Shows and Movies” to send out a newsletter about binging on some of the recent videos that I had made. It had an almost 50% open rate…whoo whoo!!! Pro tip… I only sent it out to the very small segment of my audience that would like those exact videos. There is no sense blasting your whole list if only a few of them will be interested. I am not as creative or as up on what is popular as the people who edit the major magazines. They KNOW what is interesting and will make people pick up and buy their magazine! Okay, all of those are ways to come up with my own ideas. I take bits and pieces of things and weave them into my ideas and make something new. That said, it is also possible to get inspiration from what other people are doing, preferably not exactly in your niche since copying someone else is rarely a recipe for greatness. I am always happy to have someone else do the heavy lifting for me and Paper.li lets you create your own little newspaper based on topics and writers that you find interesting. They are really good at filtering content and make sure to only send you great info. I like it for finding things to post, and maybe a wee bit of research for my own posts based on what they have said is popular. 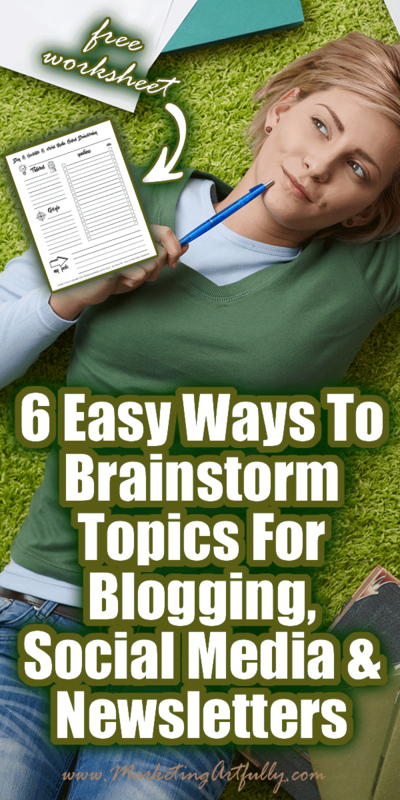 Bloglovin is good for finding popular, “right now” topics that people are talking about. Google Alerts will email you a list of content that is published each day or week on specific keyword you define. Pinterest – I know, we heard about Pinterest before but we didn’t look at any of the pins that we searched for. I like to use Pinterest in the same way I use magazines, to figure out how to structure great headlines that will catch a reader’s attention. 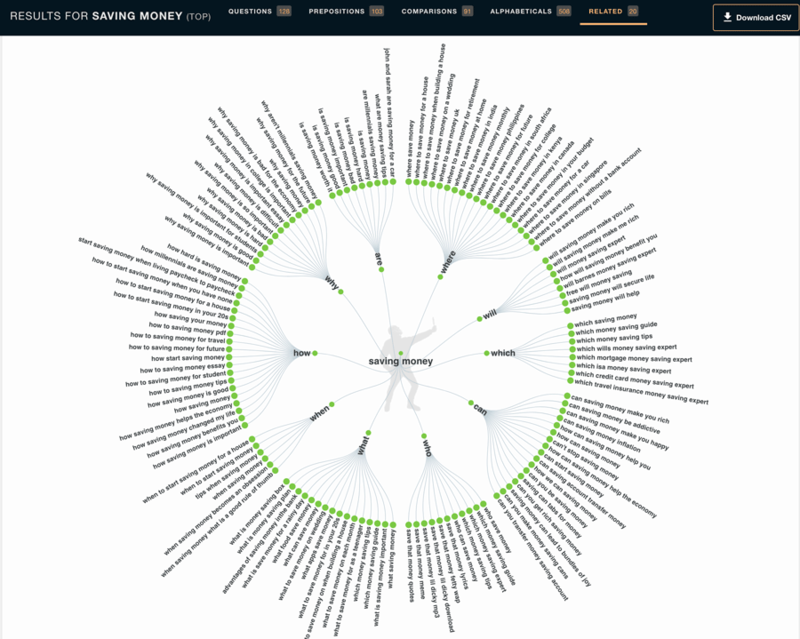 Instagram Explore – Kind of a neat way to see what is popular in different topics right now. They base it on hashtags you follow and then have categories you can search through. 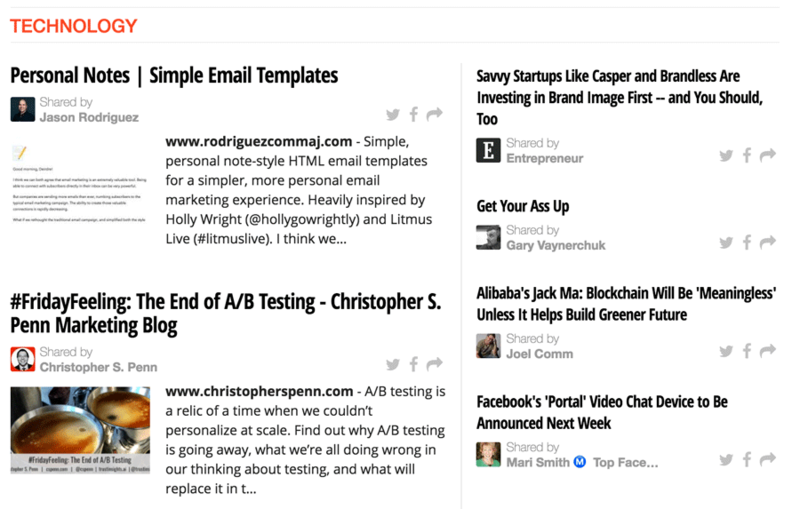 BuzzSumo – Will give you an idea of what is popular on social media right now. 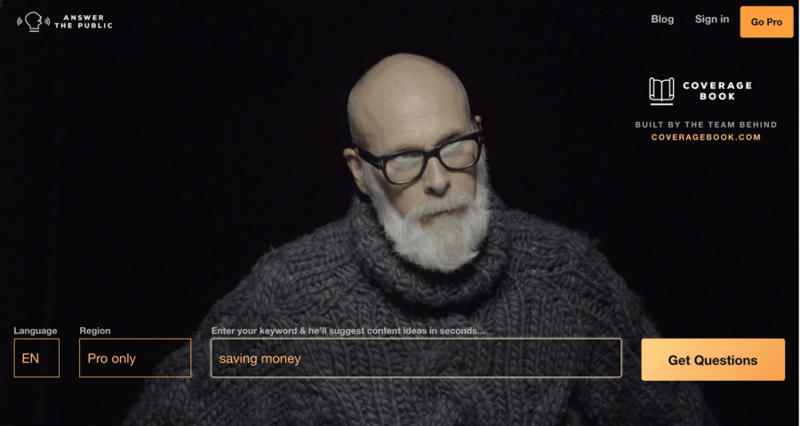 SEMRush – a paid research tool that gives you a fair number of free results INCLUDING ad verbiage which is great to check for ways to write your titles. ANY time someone is paying for results, they will be doing some serious split testing to see what works the best!